As the festive sessions nears, many Malaysians would be making their journey back to their hometown. 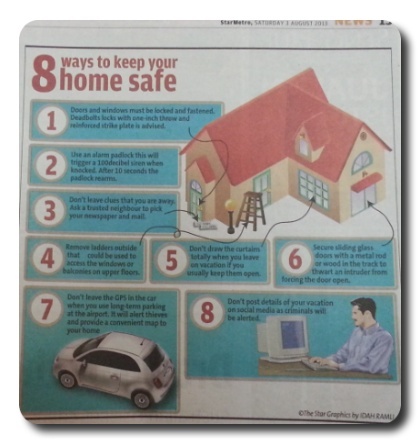 There are some very good tips provided by The Star paper on tips of keeping your home safe….especially when you will be away during the joliday sessions. 1. Doors and windows must be locked and fastenened. Deadbolts locks with one-inch throw and reinforced strike plate is advised. 2. Use an alarm padlock this will trigger a 100 decibel siren when khocked. After 10 seconds the padlock rearms. 3. Don’t leave clues that you are away. Ask a trusted neighbor to pick up your newspaper and mail. 4. Remove ladders outside that could be used to access windows or balconies on upper floors. 5. Don’t draw the curtains totally when you leave on vacation if you usually keep them open. 6. Secure sliding glass doors with a metal rod or wood in the track to thwart an intruder from forcing the door open. 7. Don’t leave the GPS in the car when you use long-term parking at the airport. It will alert thieves and provide a convenient map to your home. 8. Don’t post details of your vacation on social media as criminals will be alerted. Some other interesting tips include do not cancel newspaper delivery but get your neighbors to help collect them instead. Use a light timer that is programmed to on the lights at a certain time. Contray to what people always do…keeping the lights outside on, one should instead keep the inside lights switched on as it gives outsider the impression that someone is still awake. Turn your house phone to silent mode or unplug the phone plug as unanswered phone is a giveaway that no one is around. Someone I knew stayed alone and go for long trips overseas to visit her daughter. She has 2 dogs- in the past she would send her dogs to pet hotels but the charges is high. Now, what she does is that she pays a neighbor to help turn on her lights at night, feed her dogs twice a day, water her plants, collects her mails and….clean her dogs’ pooh. But young children about 10 consider it as a good way to earn some pocket money. As she usually closes her house door all the time, with her two dogs at the garden, onlookers are getting the impression that someone is at home. So, keep your home safe. In Klang Valley, residents could also fill up the “Safe Home” campaign application form that can be obtained from police stations. They would need to provide their names, contact numbers, date of departure and return as well as the registration numbers of vehicles left on the car porch or parked outside. To our police force who are working hard to take care of our safety and curbing crimes….we THANK YOU with sincerest gratitude.